For the second night in a row we have an Istanbul derby in the Euroleague which means this city is going to be a pretty lively one heading into the weekend. With four Istanbul sides in the Euroleague, this situation isn’t a surprise but with the double header week bringing games together thick and fast, there is no doubt that this is going to be one of the most intense few days of basketball in the city. Galatasaray have a 1-6 record and they enter this derby match on the back of a loss on Wednesday night. They fell in Kaunas and there will be plenty of Galatasaray fans who are worried about this game. Sinan Guler had a decent game for Galatasaray, picking up 15 points with 11 of them coming in the first half of the game. Blake Schilb managed to provide 12 points in the defeat while both Justin Dentmon and Emir Preldzic offered up 11 points in the loss. Perhaps the fire of a local derby will be the factor that thrusts Galatasaray into life this season? The away side move on to a 5-2 record and it remains to be seen what mood they’ll be in. They should be flying after becoming the first team to get beyond CSKA Moscow this season but that result may have taken a lot out of the side. There is also the fact that the players may struggle to get back to earth after their stunning win. There was a squad full of star players on Wednesday evening but James Anderson delivered 20 points in the game while Brad Wanamaker was involved all over the court. The player managed to deliver 18 points, 5 rebounds, 7 assists and 4 steals and there will be some CSKA Moscow players seeing Wanamaker when they shut their eyes. Other key players involved for Darussafaka were Will Clyburn with 14 points and Adrien Moerman who offered up 11 points. 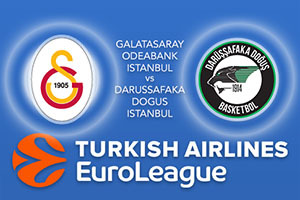 Local derbies can be quite tough to call but look to take Darussafaka Dogus Istanbul at +1 which is provided at odds of 1.90. With the Over/Under market for this Euroleague clash, look to take go UNDER 168.5 at odds of 1.90. Bet Now!